He went from gruelling 18-hour days in his fine-dining restaurant kitchen to backpacking around Asia on $10 a day - and Kevin Thornton is loving life. Here, the top chef tells how losing his two Michelin stars helped him to find himself. Muriel Thornton first learned that the fine dining restaurant she had run for years with her chef husband Kevin had lost its Michelin star when a food critic tweeted in disbelief that the new list of starred establishments did not include Thornton's. It was the summer of 2015 and it was a significant news story. Kevin Thornton is regarded by many as one of the best chefs the country has ever produced - the first Irishman to be awarded two Michelin stars - and here he was being stripped of the accolade. He described it at the time as akin to being "stabbed in the heart". But it was Muriel, whom he met when she was just 17, and the business brains behind his restaurants since their first venture, Rathmines' Wine Epergne opened in 1990, who had to process the news first. Kevin was up the Dublin Mountains at the time, foraging for herbs. "It was a huge shock, completely unexpected," she says. "But then I started to think, 'F***, this is a great thing [because, she believed, it would force them to do something completely different]. "But it took Kevin a while to come around to that way of thinking. He felt very judged and it was an open trashing because it was a very public story." The loss of the star hurt business almost immediately. Profits dipped and a year later the pair announced that they were shutting the restaurant. 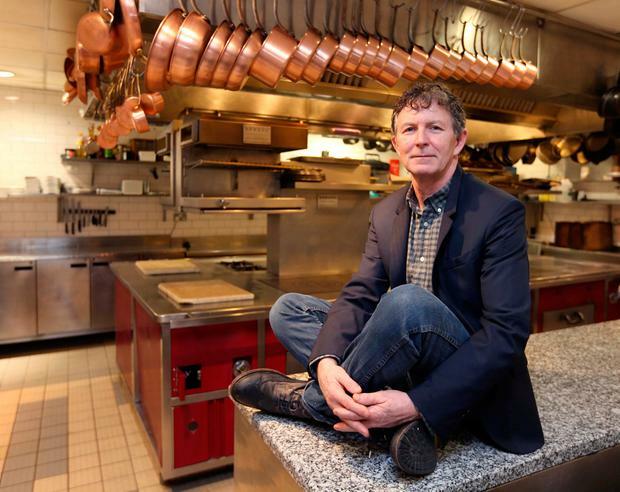 After 26 years of cooking at the highest level, Kevin Thornton was walking away. Today, in their beautifully designed home in Ranelagh, Dublin, the Tipperary chef says he has no regrets. Life, he insists, has never been better. He's able to indulge a passion for travel - slumming it in far-flung countries for weeks at a time. "I go to Vietnam," he says, "and I spend six, eight or 10 dollars a night. Muriel says, 'There's a great spa hotel you could go to that costs $150 a night' and I say, 'Are you crazy?'. I want to stay grounded." Now, the couple can enjoy opportunities previously unavailable to them due to the demands of a spotlight-always-on kitchen. This month, they travel to Cornwall to see one of their favourite bands, Massive Attack, in concert. "Those were the sort of things we could never do when we had the restaurant," Muriel says. "He gave everything to it - there wasn't a day when he said, 'S***, I have to go to work'. It's great - we've a good balance to our lives now." And with no mortgage or creditors to worry about, they enjoy a financial stability that has allowed them to work at a much gentler pace. Kevin points to a pierced ear. "I got this done when I was 17," he says, with a grin, "and this one" -his other ear - "done last year." He says he has lifted all the shackles off and discovered that there's more to life than supremely complex dishes. "As a chef you'd be working 18 hours a day," he says. "You need to be able to come down and when we closed the restaurant, I had to do something to come down. And that something was travel. I needed to adjust to a completely different pace of life and I've managed it. But, I'll be honest: I was scared - scared that I wouldn't be myself." Muriel insists they have no regrets. "I was saying to Kevin, 'We can't keep going like this'. We had signed seven-year leases. We had been there [in the Fitzwilliam Hotel on St Stephen's Green] for 14 years and the next lease was due. We were looking at changing the type of thing we were doing. Michelin never reflected us as people - that stuffiness, the linen tablecloths, very particular cutlery. Kevin used to always say he'd love to have a restaurant right on the water. I said, 'We cannot sign up - you'll be going out of there in a box'." 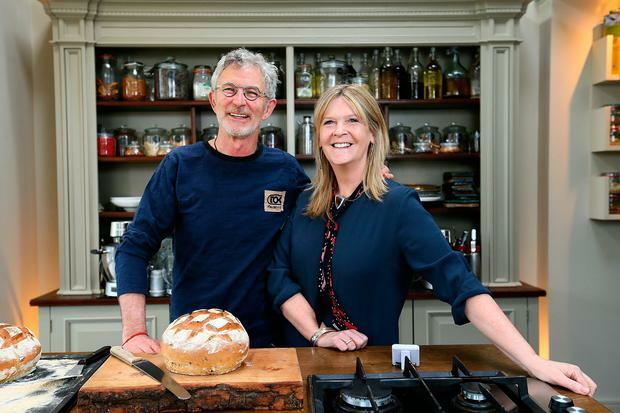 They may not be in the restaurant business any more, but Kevin and Muriel Thornton have channelled their food expertise into new ventures. There's catering for those with exquisite tastes and - presumably - deep pockets and there's cookery classes in the light-filled kitchen of their home. Numbers are kept to six or eight for these Kooks classes and the price - just under €300 - seems reasonable for the opportunity to enjoy hands-on tuition from a master in a relaxed environment. Students get to eat the fruits of their labour and presumably fire questions about food at Kevin. So far, men have out numbered women, according to Muriel. "It's 60/40 men," she says. "I find that fascinating. Men love to cook. For women, it's seen as a chore - unless that's what you're into. But for men, they love to zone out put on the music and go into the kitchen." Her husband's fascination with everything and anything to do with food seems undimmed, not least when reminiscing about some of the skills he learned more than 30 years ago in the globally famous Lyon establishment, Restaurant Paul Bocuse. The giant of French gastronomy died earlier this year and Kevin Thornton feels he helped raise the standards of chefs everywhere. He is happiest in the kitchen - one that still bears some of the hallmarks of his days in the restaurant trade, including a large selection of gleaming copper pots he bought in Paris at the end of the 1980s. Each cost more than £100 at the time - a lot of money - and they've clearly been given TLC in the decades since. Thornton produces some hand-dived scallops for Weekend and rhapsodises about the quality of food to be found on this island. He says there's great beef, but our pig-meat production could be so much better. He pan-fries one batch of the scallops and serves it with a sumptuous puree and the rest gets the crevice treatment. Both dishes are sublime, especially when the juices are mopped up with an olive oil bread he's just made. The oil, he says, is the best he's found in Ireland lately and was sourced at a nearby mosque. He insists that anyone can learn to cook, especially the rudimentary dishes that are the bedrock of healthy eating. In an environment where obesity is becoming a significant crisis in Ireland - we're on course to be the fattest in Europe by 2030 - he believes it is essential that people learn to cook from an early age. Unsurprisingly, he is evangelical about local produce and seasonality and he believes the supermarkets "who really dictate what we all eat" have upped their game of late. "But they could do an awful lot more." And he dislikes the idea of lone dining. Food, he points out, is an opportunity to connect with friends and family - whether the setting is a restaurant or the dining- room table. "Dinner really is about bringing people together. You could have the best food and wine in the world but if you're with the wrong person it doesn't taste of anything. But you can have the simplest thing and be with the most magical person and it's 'Wow!'." His love of food was fostered at an early age growing up in Cashel. He felt a connection to the land even though he didn't come from a farming family. But he had a traditional upbringing too, especially when it came to set ideas about eating. "My sister doesn't eat fish," he says, "and that's because my father made her sit down for two hours until it was gone. A couple of years ago we were in London at a tasting restaurant and she said she can't eat fish - I hadn't realised it was quite that serious. "But food is a memory. It's like music and smell. If I hear Queens of the Stone Age now, it reminds us [Muriel and him] of driving from San Francisco to LA in a convertible." He had a complex relationship with his father, a truck driver, who's now deceased. "He had a tough dad," Muriel says. "He was a very harsh disciplinarian." "I swore I would never treat anyone like that," Kevin says quietly. "School was even worse… you'd get the s*** kicked out of you all the time. And then you'd get to work [when he first started] and it was the same s***. The chef was screaming at the commis and he dragged someone onto the range. It was my turn next and I just legged it - there was no way I was going to let him do it to me." He insists that he was a good employer to the staff at his restaurant. "I was very strict but very fair." "There's no time in a busy kitchen for 'Excuse me, please, would you mind doing that?'" Muriel adds. "The first thing Kevin used to do was shake hands with everyone and the last thing at night was to shake hands with everyone. And they'd know that if he said 'That sauce is crap, do it again' it wouldn't be held against them. It wasn't personal." "You can't serve up sub-standard dishes," Kevin says, "and say, 'Sorry, I wasn't feeling well today.' We had a rule where whatever is upsetting you, you leave it outside the restaurant. I saw it as a team. Of course, I'm not a saint - but it wasn't a power trip. I would scrub the floor with my hands and knees if it needed it. If somebody disrespected a kitchen porter, I would kill him… nobody is better than anyone else in life in that we're all just passing through. We're privileged to be here in the first place." Both say they have become much more mindful of their mental health. "If you're in that position all the time where you're giving people grief and you're treating them like s***, you can feel it inside you and it takes nothing to be nice," Kevin says. "But it takes so much energy to be nasty. And that's toxic." Kevin's creativity isn't just confined to cooking. He's a keen photographer and enjoys art. He shows Weekend a guitar that he expertly painted and there's a large bronze sculpture of a tuna fish that he cast in his kitchen. He's got some famous friends, including Michael Stipe of REM. They met when Thornton cooked for the band when they were staying in Luttrellstown Castle, Dublin, around the time of the Monster album in the early 1990s. And his love of the arts has informed the way he presents food. Both scallop dishes are so prettily put together, it's almost a shame to have to eat them. "Kevin believes you eat with your eyes first," Muriel says. "Even if it's just the two of us eating here, he'll never just slop something on the plate." The couple's son Conor (24) still lives in the family home and is trying to carve out a career as a musician. It's early days, but the work he's delivered to date suggests he has plenty of talent. Another son, Edward, was given up for adoption as Muriel was still a teenager when he was born and the pair felt they were too young. But when he turned 18 contact with his birth parents was reestablished and today Edward is very much part of their lives. He is also a musician. Both children have resisted the temptation to go into the restaurant business - and it's hardly a surprise when one considers just how lengthy and stressful the chef's day can be. Right now, there's a shortage of chefs in Ireland and school-leavers seem to baulk at the idea of hours that are relentless and anti-social. Kevin says he understands that attitude and feels that cheffing is a career that suits those who feel a true calling to it. But rising to the top does not instantly mean contentment - as he knows only too well. "Sometimes the restaurant becomes a monster, particularly that time when we had two stars," he says. "And you become part of the monster." Those days are behind him now, he insists and, despite numerous offers, neither expects to open a restaurant again. And with Kevin planning his next spot of travelling, who's to blame him?